The axolotl may not be a very common pet, but it is definitely a unique one. Axolotls are a type of salamander, but unlike salamanders, they do not routinely undergo metamorphosis from the larval (with gills) to adult form and remain aquatic their entire life. Axolotls can be found in a variety of colors including black, grey, golden, albino, white with black eyes, and other colors. They are relatively easy to care for, but they live their entire lives in water, so you must be able to provide an adequate tank that is kept at the right temperature for this animal. Axolotls are from Xochimilco Lake in Mexico, where they are considered an endangered species because so few of the canals leading to the lake are left. Thankfully this depleted species is readily bred in captivity and is a popular subject for research due to its unique capability to regenerate entire limbs. The most commonly seen type in the remaining canals of Xochimilco Lake is the nearly black axolotl. Axolotls are relatively hardy animals. They are tame in nature. These creatures should be thought of as a display pet since they cannot interact with their pet owners outside of their tank. They are delicate, soft-bodied amphibians with permeable skin. Axolots should not be handled unless absolutely necessary. They are not especially social animals and do not benefit from having a companion. 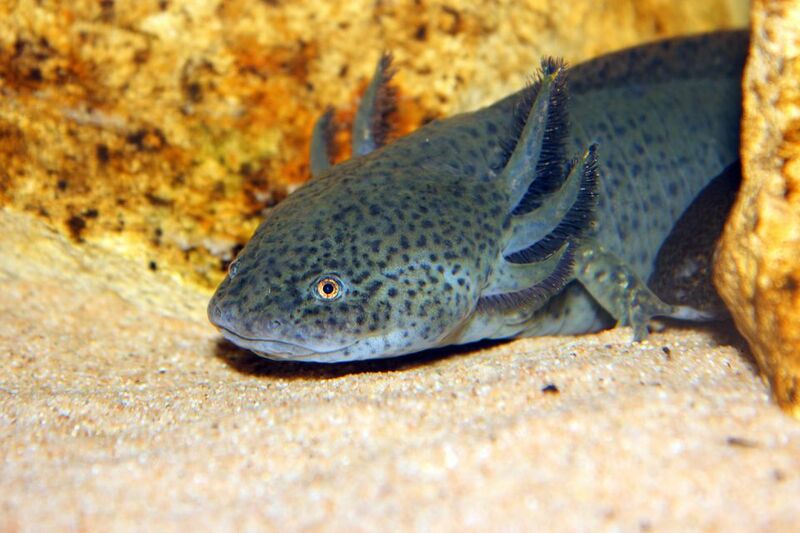 Axolotls can get quite large for a salamander, so at least a 15 to 20 gallon fish tank (aquarium) is recommended, although the tank doesn't have to be full of water (the water only needs to be just deeper than the full length of the axolotl). The tank should be kept in a cool room away from bright sunlight. The water temperature should be kept cool, between 57 and 68 degrees Fahrenheit (14 and 20 degrees Celsius), and never allowed to get above 75 F (24 C). No special lighting is required for axolotls (unlike reptiles), and in fact, a place to get out of the light may be appreciated, such as a flower pot laid on its side or an aquarium castle. If gravel is used on the bottom of the tank, it needs to be coarse gravel. Fine gravel might be ingested during feeding and cause an obstruction. Some owners opt to simply leave the bottom of the tank bare, although others believe this may stress the axolotls a bit since they can't get a foothold on the bottom of the tank without gravel. Juvenile axolotls can be cannibalistic toward each other, so they are best raised in separate enclosures. Adults can potentially be housed together but watch for cannibalistic tendencies. If a body part gets bitten off by a tank mate, an axolotl can regenerate it over time, but this should never be encouraged or allowed. Most owners will find a filtered aquarium easier to maintain than one without a filter since unfiltered water will need frequent changing. However, if you do choose to have a filter on the tank, the filtration rate should be fairly slow, and powerful filters that create strong currents should be avoided. Also, be sure that the filter intake is not in a position to trap the gills of your axolotl. If you have a filter, safe cleaning would consist of using a siphon to vacuum the bottom of the tank, and a 20 percent water change should be done weekly. If you are not using a filter, you will have to do a 20 percent water change every day or every other day. Never do a full water change as this creates a situation where the water chemistry changes too drastically for your pet axolotl. Tap water should have any chlorine or chloramines (added during the water treatment process) removed using commercially available solutions. Never use distilled water and make sure the pH of the water remains between 6.5 and 7.5 (neutral). In the wild, axolotls feed on snails, worms, crustaceans, small fish, and small amphibians. In captivity, they can be fed a variety of brine shrimp, small strips of beef or liver, earthworms (though wild caught worms can carry parasites), bloodworms, tubifex worms (often fed to fish), other frozen fish foods, or commercial fish pellets such as salmon or trout pellets. Pellets can also be purchased directly from the University of Kentucky where they breed and distribute axolotls to laboratories and classrooms through their Ambystoma Genetic Stock Center. Uneaten food should be cleaned from the tank daily to help keep the tank clean. Under some circumstances, the axolotl can undergo metamorphosis into a terrestrial from, although this can be stressful on the animal and is not commonly seen. The conditions under which this would happen naturally is poorly understood, but we know that the metamorphosis can be induced using changes in water characteristics, or by supplementing the axolotl with certain proportions of thyroid hormone. Of course, the terrestrial form of the axolotl has a completely different set of care requirements. Trying to induce metamorphosis is not recommended, as this can place undue stress on an axolotl, and can significantly shorten its lifespan. Axolotls often eat gravel or part of their substrate and are commonly prone to gastrointestinal obstruction and foreign body ingestion. Bowel obstructions are a common cause of death and gravel and other objects in the tank should be carefully sized. Prior to purchasing an axolotl, you should speak with a representative from your state's agency. Axolotls are legal most places in the U.S. except for California, Maine, New Jersey, and Virginia. In New Mexico, they are legal to own, but illegal to import from other states. Depending on your state, you may be able to purchase an axolotl from a breeder or an exotic pet dealer. Do not buy these animals through the internet or any other black-market means. Speak to an exotics veterinarian if you are looking for a reputable source. Otherwise, check out other lizards that can be your new pet.